Is it just me, or does it tire you too that everything revolves around money? I’m not proud of it, but in the past, I vividly remember praying (more like begging) God for more money. Its thoughts and prayers like this that bring the waterworks. You know, the big tears and snot that makes you cough and feel like you’re going to die crying. Even the hot shower doesn’t drown out these cries. Oh Momma, if you’re in this place, I feel your pain. I feel it deep in my soul as if it happened just yesterday. Oh Daddy, if you’re here searching for ways to make money to support your family, I know what you’re going through, too. You’re not alone. 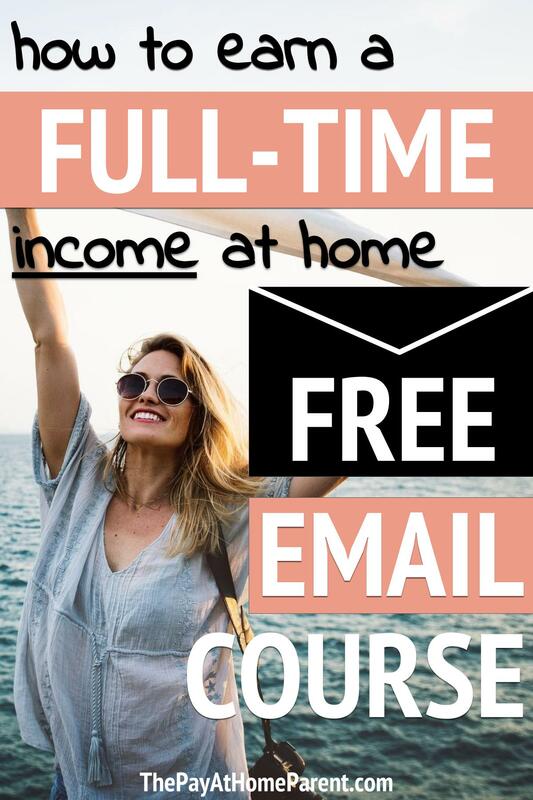 For a limited time, grab this FREE email course by a fellow introvert mom who spills ALL of her secrets that helped her earn $50,000 per year working a part-time schedule at home! Does the phrase sound familiar? I’m pretty sure we’ve all said this once or twice (or a hundred times) in our lifetime. But here’s the real problem when we admit to needing money now. We start to look for it in all the wrong places. We ask family, friends and banks for a loan, or even worse, we get into credit card debt. But when you need money desperately, you shouldn’t have to do any of these things. I know, because I’ve been in your shoes and I’m here now to tell you that I’ve made it out alive (and thriving). There are actually tried and true ways to make money online and locally (for those who aren’t computer savvy). If you are willing to do the work (no, it doesn’t cost you a penny to get started and no, it’s not grueling labor by any means), then you can very easily make money within a week. I’m going to share with you the quickest ways to make money without a job. You won’t necessarily cash in overnight and you certainly won’t become a millionaire with these side jobs, but you can use them to make ends meet if you’re truly desperate for money. It’s okay to reach out for help. I’m here to share my journey and show you legitimate ways to supplement your income when you need money now. This list offers some quick ideas to make some extra cash, but it’s going to take some hard work and effort on your part. You’ll also need to consider trying a few of these to make enough extra money fast. This mom makes $50,000 per year and teaches how in her free 9-day email course! Signup to learn more. Let’s say you’re watching your favorite TV show while surfing the web for some ideas to make extra money. Well, stop searching, because you can sign up with Survey Junkie right now and make your first few dollars in minutes. Surveys typically pay between $.50 and $1.25 each but take as few as 5 minutes to complete. While you binge watch your favorite show, why not earn extra cash in the meantime? Check out these other paid surveys if you like Survey Junkie! Do you have a few valuable or useful items lying around that others in your neighborhood would pay money to borrow? Sign up for a free account with Fat Llama and check out the things that people are renting out for extra cash every day. You can make some fast money by renting out some of the things you aren’t using right now. Fat Llama isn’t available everywhere just yet, but they are growing like crazy. If you live in a popular or touristy location, consider renting your home (or a room in your home) on Airbnb. Some people will list their home on Airbnb for anywhere from $100 to $400 per night (depending on location) and then grab a few nights in a local hotel while their home is rented out. In this case, you pocket the difference between your Airbnb list price and your hotel/motel stay. Sign up for a free account with Airbnb and start renting out your home for some fast cash! You can even have fun with it and go on mini vacations to homes in your area. Just make sure you choose a stay that is cheaper than the price you rent your own home for so that you can make some money on the deal. Get up to $55 credit toward your future stays here. Though I’m not one for driving, many people report decent hourly wages when they pick up Lyft driving gigs on nights and weekends. If you live in (or near) the city or a busy town, sign up for Lyft and log in on nights and weekends to grab some lucrative driving gigs. Lyft offers up to $200 as a signup bonus as of 10/9/2018 and you get to pocket your tips! If you haven’t heard about and taken advantage of all the cash back apps on the market, then you’re missing out on free money every single day. With competition for your digital dollars on the rise, there are companies that will pay you money to click their links before you shop. But Dosh makes it even easier and allows you to get cash back just by shopping in stores as you normally would! Don’t take my word for it. Sign up for Dosh, grab your first $5 bonus when you link your card, and start raking in the cash back perks! Here’s another cash back app that you need to have on your phone when you need money now. Ibotta is geared toward grocery shopping and gives cash back bonuses for a lot of items that you already purchase. Between my husband’s quick trips to the store and my planned shopping trips, we easily earn some decent cash back each month. Sign up for Ibotta and get your first $20 bonus plus cash back on your qualifying purchases! Get an instant cash offer for your used smartphones and other devices from Gazelle. It’s extremely quick and easy to grab a quote for your device. If you like the price offered, then go ahead and follow the instructions to ship your device to the company. Once they receive it, they’ll send you your money fast! Gazelle makes it easy to sell your extra gadgets when you need money now. If you can listen and type quickly, then try your hand at transcription. The pay starts out small, but if you get accepted for as an independent transcriptionist for Scribe, I’ve seen them offer some pretty steady work over the years. Sign up for Scribe and start transcribing in your spare time so that you can cash out on your spare time. Sign up to InboxDollars and grab your first $5 bonus. Then peruse the list of surveys, games and easy tasks that will help you earn some extra cash in your spare time. If you need money now and have some extra time throughout your days, then InboxDollars can help you earn money while going about your busy day. I love this quick way to make money online. The official term for this side gig is called flea market flipping. You can buy and sell used clothes, books, toys, electronics and many other items that you find for a great price. Simply find great deals in your area and list for a profit on sites like Facebook Marketplace, Craigslist or eBay. Don’t forget that your boss might have some extra work at your current job. If you’re really strapped for cash and need money today, you should be working overtime (like yesterday). Ultimately, your goal is to get your bills paid and meet your needs. If that means working some overtime, then don’t be afraid to ask for it! These are not your typical online “make money for doing nothing” suggestions. Each one of these is going to require some time and dedication to get the ball rolling. But once that ball is rolling, you could be raking in the extra doe! Get started on a few of these today and you could have some extra money in your pocket by the end of the day. Stick to them daily and you could have a few hundred extra by the end of the week. Hustle hard and you could have an extra $1,000+ in your pocket by the end of the month! But no matter what, just remember that you’ll get out of these job ideas what you put in. Don’t expect to sit back and watch the money roll in – that just doesn’t happen for anyone overnight. Instead, hustle hard and build the income you need to make ends meet (and more). I created The Pay At Home Parent in February of 2018 to help you be a successful home-based business owner, blogger or side hustler. As a wife, mom and frugal homemaker, I still make a full-time income on a part-time work schedule and I know that you can too!